(I found these at Dollar Tree.) If you can't find these to buy, then glue word strips to real dice. The results are the same. 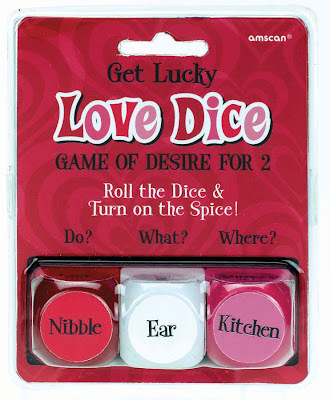 The day of your date night, give your spouse a mini gift bag with the dice in it. Attach a tag to the bag which says, "Life with you is Pair-A-Dice. Can't wait for date night with you tonight..."
If you use a set of three dice, you could change your tag to say "Are you feeling lucky? Can't wat for date night with you tonight..."
Here are some other spicy dice sets to give you ideas if you need to make your own. Google "spicy dice" or "love dice" for other ideas and images. YAY!!!! I'm never first!! Thanks Cher! I love this idea. I also want to thank you for sharing the Pure Romance site! I love it! I've wanted a set of these for so long! I love this! Have a happy Monday~ I am slowly making my way through all of the comments that I so lovingly received last Thursday when I was featured on SITS. Thank you so very much for visiting me. I absolutely love this site and all the fun ideas you have! My husband got us dice like these awhile ago. He is definitely a fan. Sat. night we did your "bookstore date". It was so much fun--thank you for the great idea and print outs. My wife made these for us a few years ago using dollar store plastic dice (about 2" cubed) and she called them "Dirty Dice" She made 3 like the love dice by wrapping them with paper with do, what, and where printed on each die.